My favorite concept is triadic superimposition. I found that I was never able to really make good melodic and cohesive improvisations when I tried to rely on my scales and modes. A friend of mine hipped me to using triads and it all clicked! I was suddenly able to play through changes with better phrasing than ever before. My ideas had more motific and melodic development as well. In a nutshell, I feel my improv level took a quantum leap. If you think about it, many of the big names are masters at this. I hear guys like Herbie Hancock, John Scofield, Pat Metheny, Kurt Rosenwinkel, Scott Henderson, and Jim Hall using a ton of triadic ideas. There are of course many many others. I only named a few of my faves. Here is a sheet (thanks Jinshi!) that details some suggested useages for the different types of triads with fingerings. Lets get this thread going with some of your faves as well. I'll try and dig up an audio lesson I did on this topic when I get home. In the meantime, dig the diminished triad subs. So effective and you'll recognize the sound immediately (Scofield, Henderson, Hancock, etc)! For the major and minor types, I'll need to add some subs. For instance, playing a major triad a minor third below the Valt of a ii-V gives 13, b9, maj3 or using a major triad up a whole step over a dom7 to give the Lydian b7 sound. I like dim triad/arp a 1/2 step up from the root on Dom7. I'm sure I have heard Henderson do this. Whassup Brooke!! Thanks for joining!!! 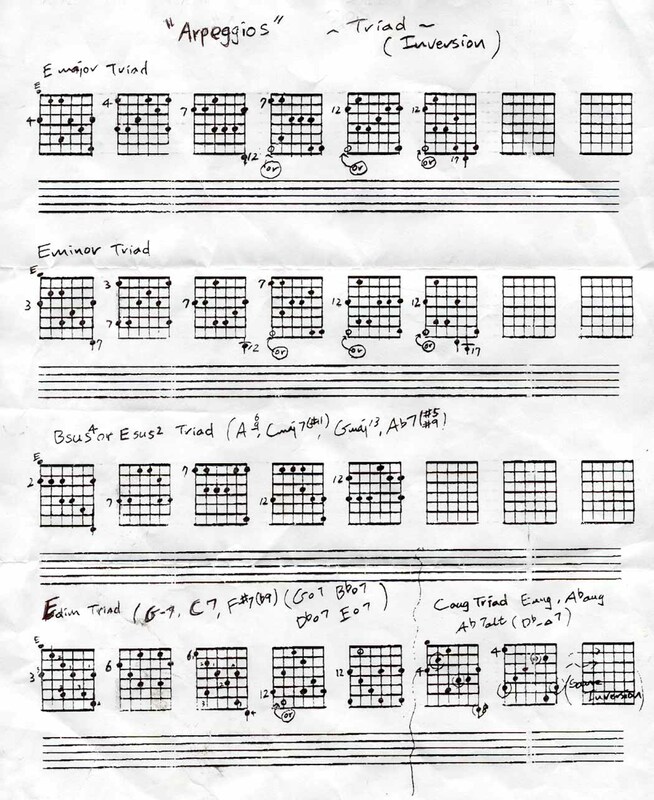 Major triad half step down from the root of minor chord. Henderson uses this on Dense Dance at 2:50 and probably other places. Very Cool! I use it too much already. I am sure ScottL has mentioned this. "For instance, playing a major triad a minor third below the Valt of a ii-V gives 13, b9, maj3"
That lick I couldn't figure out in "Blue Bossa" is an example of this. You are playing 7/5/3/7 on the Ebm then 3/b9/13/3 on the Ab7 which is the same lick down a half step. Thanks Robert! There are some great instructionals that really demonstrate these concepts. Shoot me an email of forum and I'll try and help if I can. Been a bit under the weather with my bad back. Thank god for Percoset!! !